This week, we return to what happens when Anger ignites a movement. In January of 2016 on Nauru Island in the Pacific ocean, a one year old child poured boiling hot water on herself while her mother’s back was turned. She didn’t do it in the kitchen of their home, but in a refugee detention center on the island where Australia detains and sometimes processes the refugees which attempt to reach its shores. Out of sight out of mind is the basic building block of Australia’s refugee policy. From this it has built a powerhouse of offshore processing facilities which are now becoming popular with countries the world over experiencing their own immigration issues. It is a building block crucial to its success. The child that went on to be called baby Asha by the media was flown to a hospital in Brisbane in Australia’s ‘sunshine state’ for emergency treatment. 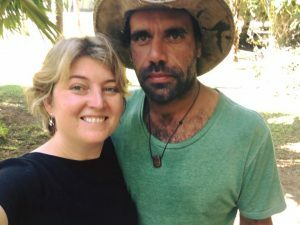 Over 15 years of the dehumanisation of refugees by Australia’s political eite meant that all previous experience indicated that she would have been deported without a fight straight back to Nauru, against medical advice, to live in an overcrowded tent in the sweltering heat, with minimal medical facilities. But this didn’t happen. Instead, a group of unionists found out about Baby Asha. 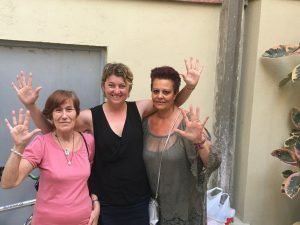 Within hours, the indignation of 10 people had gotten them out of bed and down to Lady Cliento hospital in the middle of the night to set a vigil and spark a movement. media strategy which centered on bringing even the smallest details of the family’s personality and struggle into the sight of public opinion, undermining the very building blocks of the government’s policies. As baby Asha caught the attention of the nation, organisers called for a halt to the detention of 250 child refugees in a campaign called Let Them Stay. The children’s favourite bands and cereal became the content for a digital campaign by Get Up, an online campaign organisation, and soon the whole country was being forced to examine the unexamined. Was the deportation of sick children really acceptable? Despite the public attention that the campaign had managed to sustain, the government was intent on sticking to its guns. But in the heat of the moment, the unionists and church goers at the vigil refused to back down and instead stopped them in their tracks. Find out how a small group of organisers channeled their anger to challenge the national zeitgeist and the national police, achieving the greatest reversal in refugee policy in Australia for a decade. Like a flash in the pan, white hot rage can spark a fire so hot that it disappears as fast as it came. A victim of its own ferocious intensity. This week on Changemakers is the first of a two part series looking at how campaigners can harness this moment of indignation into something more than rage. In campaigns to shift long entrenched prejudice, a streak of lightning often isn’t enough to bring the house down. It’s what happens afterwards that counts. After the moment of indignation that sparks an outpouring of rage,when the frenzy threatens to take hold, what do you do? In part one, the spark was a black man from a township outside of Capetown, South Africa. Everyday, he traversed his lavish university campus to get to class, before returning to his home outside the city where they lacked even basic sanitation. For this student, the injustice of being looked down upon while he did it by a statue of Cecil Rhodes, a prominent white colonialist, finally became too much. So he brought a bit of home with him next time he came to campus, just to even the playing field. He brought piping hot hunks of feces. He threw them in Cecil Rhodes face. In the days after Chumani Maxwele threw poo at the statue of Cecil Rhodes, students at the University of Cape Town felt empowered to discuss their own issues with the institutions ongoing glorification of colonial heroes. Sparks went flying everywhere, as the courage to call out the silent racism that adorned the campus walls and stood taunting them in the squares spread from student to student. Before they knew what was happening, students had occupied the university administration offices and refused to leave for over a month. While they held their ground, they came up with strategies to widen their demands from the removal of one statue to the removal of all the colonial vestiges of white privilege that remained, 25 years after apartheid had fallen. The first and most important agenda of the occupation was solidarity. Their display of strength allowed them to achieve their goals, and from here spark an even more ambitious movement which spread like wildfire to universities across the country. New, clever ideas came to the fore to keep the movement from dying out. On the other side of the country in Johannesburg, students did something even more audacious than throw poo at a colonialist hero. Strikes, occupations, hashtags, shutting down bridges, even marching on the party of their own liberator, Nelson Mandela’s African National Congress. They turned the tables on the universities by using tactics that showed they already had the strength that they were asking for. They were proclaiming their own equality, and thus demanding, not asking, that the university do the same. Like Chumani Maxwele did when he threw the poo, they continually brought the locus of their anger front and center, and so never lost the spark that kept them alight. But at the pinnacle moment of their movement to reduce, and ultimately abolish school fees, the fire got out of hand and the organisers lost their ability to control it. Instead they were met with water cannons, tear gas and rubber bullets from the authorities. Tune in this week to learn how activists built on a spark lit by one man to build a movement that managed to shut down every university in the country. Also, to learn their reflections on the moment in which they couldn’t quite turn that power into lasting change. It was a campaign success that shocked the world almost as much as Donald Trump’s. Even the organisers didn’t think they could pull it off. And this was no small win. It was a win that would challenge the stability of one of the bedrocks of international politics: the European Union. The verdict was in. Britain wanted out. But the remain campaign started out with an 18 point lead in the polls. So how did the Brexit coalition pull of such a massive heist of the national zeitgeist? The answer might shock you. It will come as no surprise that the devil was in the detail of the messaging. But the audacity it took to sideline their biggest existing support base to create a new message that would appeal to the masses took strategic courage which many campaigns could learn from. While the remain campaign organised what any experienced campaigner would have suggested, an inclusive- broad based coalition, the leave campaign went it alone, leaving other supportive political factions in the dust. The result reveals interesting truths about the complex realities of campaigning in modern democracy. It’s not as simple as being on the right side of history. On this episode of Changemakers, it’s a tale of David versus Goliath. The knitting nanas versus the Coal Seam Gas industry. No one could have called it. 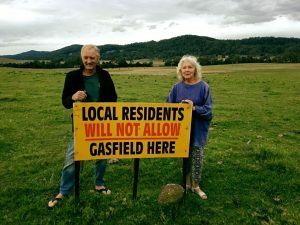 Unless of course you knew that the northern rivers of new south wales, the area of Australia that in 2010 the gas companies had set their sights on, is a hot bed of retired activists from the glory days of the 70s. Kicking it old school, neighbours talked to neighbours, and organised meetings in town halls and on street corners. The more radical types locked on to gas pipes and blockaded prospective drill sites. Their message spread like wildfire across the territory, because their message resonated with everyone. Don’t pollute our water. Don’t ruin our land. 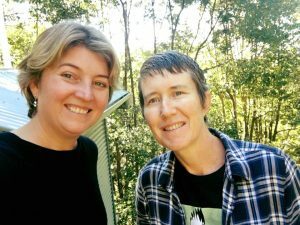 This enabled them to build a highly diverse coalition, with the guts to declare their communities gasfield free! Despite what the government and the corporations might say. Yet the powers that be didn’t quite understand that the people had spoken. So how did they finally make them listen? The answer is a mixture of very clever tactics from a powerful movement that resulted in an epic showdown. People are feeling the housing squeeze in cities all over the world. But what would you do if your neighbour, your friend, your sister? What if literally hundreds of people in your city every day were losing their homes? In Barcelona, they simply decided enough was enough. This episode tells the story of neighbours who came together to realise that the system was broken, and that together they could fight it. In 2009 they started a platform for people affected by mortgages. They formed human shields at people’s front doors and refused to let the police enter to carry out their evictions. 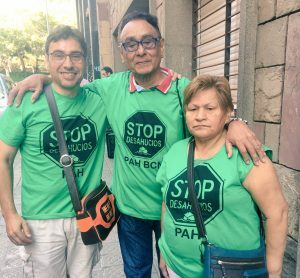 They went door by door, street by street, collecting over 1.5 million signatures to have the national housing laws changed. Their leader stood in parliament and called the bankers criminals. It was a radical affront to the system. But at every step the government chose the banks over the people. So the people decided to throw them out and take up the mantel themselves. Tune in to figure out how they built the kind of power that lasts, flexible enough to survive every obstacle, even the ones from within. We tell one of the stories that underpin the movement’s origin, set in Chicago. The story begins with a living wage campaign in the city that targeted Walmart and other big box stories. From that first campaign, it is in the mixture of success and adversary that bread new insights into their into low wage worker campaign. 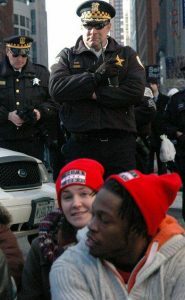 A women addresses a crowd at the sit in at At Kluczynski Federal Building to lobby Senator Durbin. The Chicago team then mixes with an equally adventurous team from New York City, and a bold service worker international union from Washington DC, the SEIU, to intentionally plan a new strategy to organise low wage workers. 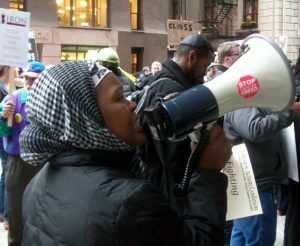 In Chicago the aim is drawn wide – any low wage worker in the down town area is targeted. In New York there is an explicit focus on fast food workers. Together the Chicago – New York – Washington dynamic produce unprecedented numbers of low wage workers signing up to the Fight for 15 campaign. You’ll have to listen to the episode to find the details! But the take away is that success came from a mix of involving everyday union members in the fight people’s and preparedness to take radical action.